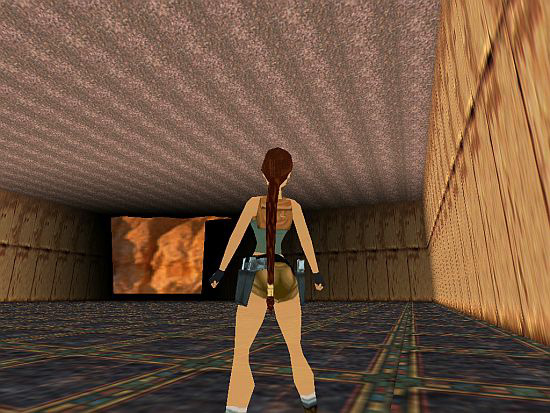 Everything in our NGLE Tomb Raider world always happens inside the rooms. So if you want to see what is outside the rooms then you won't see anything in the game but 'black nothing' out there. First maybe it sounds silliness, but it sometimes makes sense to see that 'outside world'. No, not because we want to see that 'black nothing' but because we want to see sky and horizon around our level. Since the sky and the horizon are placed OUTSIDE the rooms, in the black nothing. You don't need to place skies or horizons. All you need is provide your level with a sky and a horizon (unless your level plays, e.g., deeply inside a dark tomb, without the need to see sky/horizon anywhere.) - and the game will place them automatically. Horizons are Moveable objects with the name HORIZON. So if there's an area in the game where the player will see the horizon, then (s)he will see belt of hills everywhere on the horizon now, when Lara is turning around her vertical axis in an area like that. Skies are RAW files in graphics\wads folder, with the same name as the WAD (placed also in that folder) has. - It means, if you use X.wad for a level, then the game will use X.raw for the same level. Use some program (for example, BmpToRaw) to open RAW files. As you see, those RAWs contain the color of the sky and the pattern of the clouds. The picture of the RAW will show up in the game as a rectangle-shaped 'lid' above the rooms (and above the ring of HORIZON), showing the picture 'on the bottom of the lid'. It seems the sprite-taking object named SKY_GRAPHICS has nothing to do with the sky/horizon. You don't even need that object in your WAD. Okay, but where can I find the 'areas' in which the player will see the horizon/sky? - I mean, what shall I do to see the horizon/sky in the outside world? Well, you need to place special texture tiles on some room surface elements (room surface elements are: walls, ceiling/floor squares) to make those elements transparent. And as that element is transparent, Lara will be able to look through that, so she will be able to look out into the outside world there to see horizon behind that transparent wall, and to see sky above that transparent ceiling square. You can find that 'special texture tile' on the bottom of Room Editor, on the upper left corner of the so-called Color Palette: click on that tiny black square so a red border will show up around it. (So this time it's not Texture Panel we select a texture tile from!) Now click on a room surface element if you want Lara to be able to look through that into the outside world. That element becomes totally transparent now. Without Horizon= ENABLED value, the horizon won't show up in the game. 2. You will use a layer. Imagine that layer as a layer you painted 'on the bottom of the lid', i.e. on the RAW picture. 1. If you change a RAW of a level, you need to convert TOM to realize the change in the game. 2. You can find a special RAW in graphics\wads folder. This is pcsky.raw. If you want to show sky in a level built from X.wad, but you don't have X.raw, then the game will automatically use pcsky.raw as a RAW of that level. 3. The more extreme the layer color is (e.g. RGB= 255, 0, 0 is a very extreme one) the more it seems to override the original RAW sky color (and sometimes the extremity also affect the proper visibility of the cloud pattern). 4. There is another layer: Layer2. It works the same way (i.e. with Layer2= A, B, C, D entry) as Layer1. If you use Layer2 then you don't need Layer1. To be more exact, under 'general circumstances' it doesn't matter if it's Layer1 or Layer2 that you use for your sky. - See in the thunder/lightning section of the tutorial where I'll tell when it does. - Layer2 could be an alternative layer instead of Layer1 - see the FLIPEFFECTs below how we can change them with each other. - You can use Layer1 and Layer2 together at the same time, if you want. (Now the colors of the two layers will show up in an aggregated way.) - For example, just think about it: Layer1 scrolls the clouds northwards, but Layer2 scrolls the clouds southwards, as if you had two RAWs in the level. It looks a pretty chaotic and interesting sky. But using Layer2, the north/south intervals are swapped with each other. (So 1-127 is the south interval, and 128-255 is the north one.) Except: if both of the layers are being used at the same time. - Weather. Sky, <&>Enable/Disable the (E)Layer1/2: to use Layer1 or Layer2 or both of them at the same time. - Weather. Sky, change slowly the color of Layer1 to <&>color in (E)seconds: if you are just using Layer1 (with Layer2 together or not) then activate this trigger to change its color to a ColorRGB script value. The change will happen by degrees, so the required value will be realized in the given seconds. - Weather. Sky, change slowly the color of Layer2 to <&>color in (E)seconds: if you are just using Layer2 (with Layer1 together or not) then activate this trigger to change its color to a ColorRGB script value. The change will happen by degrees, so the required value will be realized in the given seconds. - Weather. Sky, Set new <&>Color for (E)Layer1/2: whether you are just using the given layer or not, you will define its new color (using a ColorRGB script value). The change will happen at once. - Weather. Sky, Set new <&>Speed for (E)Layer1/2: whether you are just using the given layer or not, you will define its new scrolling speed. The change will happen at once. In fact, that entry won't always help if the sky and the horizon don't fit perfectly. The command originally used at Coastal Ruins level - so the command is definitely successful there. So if you still have the original Coastal Ruins TRLE level, with the original horizon object, RAW file and layer values, then see, how the command works in the game. - And then, you can try how ugly the fit will be if you remove ColAddHorizon entry of that level (or if you type DISABLED instead of ENABLED). - Those real texture tiles can be tiles that have smaller or bigger magenta 'transparent' part(s) when you load those tiles into TBuilder. (So now I'm talking about the tiles you use usually on Toggle Opacity or Toggle Opacity 2 squares.) Let's see for example the last tile of the original TGA of Playable Tutorial Level: it's a grating. Place that grating on those surface elements - and, in the game, Lara will see the sky/horizon through the 'holes' of those gratings. - Or those real texture tiles can be any tiles, if you place them on those surface elements with Transparent button switched on. - In the game, Lara will see the sky/horizon through those transparent tiles. But don't forget: these cases won't work well if you don't texture at least one room surface element using a tiny black square, in each room where you use these cases. 8. If you switch on 'O' button in Room Editor, the actual room will become an 'outdoor area' in the game, in which Lara's hair will be moved by the invisible and dumb wind. - If you want, don't switch on 'O' button in a sky/horizon area, saying, e.g., 'this is a windless day out here now'. - If you want, switch 'O' button in a non-sky/horizon area, saying, e.g., 'this room is draughty, you should shut the windows'. & slot is the slot in which you placed the new horizon. Activate the trigger again, if you want your old horizon back. 10. In fact, you can use several types of the horizon, not only the TR4-type 'open' ring. See for example the TR3-type horizons in any TR3 WAD: it's a ring, closed by a cone at the top, and closed by another one at the bottom. 11. The 'tiny grey square' (next to the 'tiny black square') is known as a transparent 'texture tile' at textured portals (doors). But the grey square is not equal with the black square now, so don't use the grey square (or some magenta patch) instead of the black squares to show sky/horizon. Now I'm talking about the sun disk on the sky/horizon. It's not easy to define the 'real' color of the sun+beam. Because other colors affect that color more or less. For example, if the sun is seen on the sky, then the 'real' sun color is some kind of aggregation of D, E, F color and the sky color. Place Lara in a room where the sky is above her. Then hit F1 in the game. Numbers will show up in the upper left corner of the screen. (If they won't, then DOZY cheat is disabled.) Holding F1 pressed down, also hit F3 to take a screenshot. Release the keys, exit the game, and open that screenshot from the main folder of Level Editor. See the first ( A ), second ( B ) and third ( C ) number of 't' row, and type them into LensFlare entry. Without LensFlare entry, the sun disk and its beam won't show up in the game. 1. The Sun light bulb and the sun disk have nothing to do with each other, even if it's advisable to harmonize them: so, in a given room, the Sun bulb should shine in the same direction in which the sun disk shines, if both a Sun bulb and the sun disk affect that room. The sun disk has nothing to do with other light effects, either. 2. As you see, the numbers in Position A, B, C are big/huge numbers. So, if you want noticeable changes in the position of the Sun when you change the coordinates, then don't be afraid of big/huge changes with those numbers. 3. It doesn't affect the size of the sun if that is closer or farther from Lara, whether vertically or horizontally. So, if the sun is higher (i.e. if the negative value in Position B is farther from zero), and the value is X in Position A, then the sun will look closer to the center of the sky. But if the sun is lower (i.e. 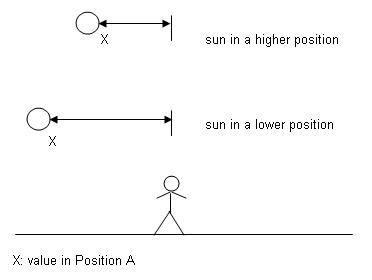 if the negative value in Position B is closer to zero) and the value is X in Position A, then the sun will look farther from the center of the sky. - And of course the same thing is true with the higher/lower sun and the Y value in Position C.
(Don't misunderstand: the center of the sky is NOT the position when, using the F1 method - see above -, the sun is exactly above Lara. So, let's say, the sun is exactly in the center of the sky when the value in Position A is 22000 (Z). Then type 12000 (Y) into Position A, so the sun will move northwards. The difference between Z and Y is 10000 units (α). And now move the sun northwards more: move it further 10000 units, so α again, typing 2000 (X) into Position A. Though Lara didn't move during the changes, you definitely found the first α move bigger from Lara's position in the game than the second α move. - And of course the same thing is true with the same horizontal distances in Position C.
- if that room is an outdoor area. 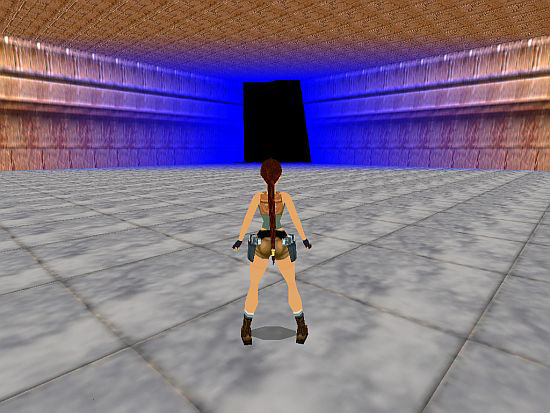 - If Lara gets too close to the room surface element where you can see sky/horizon then the beam will disappear. - If the room is an outdoor area, logical obstacles won't be obstacles for the beam. (For example, you will see 'the sun shining through the brick wall' in that room, if the game won't position the sun on the sky/horizon, but on the brick wall.) Switch on the 'NL' button of Room Editor to disable the sun+beam in that room. - Whether the room is an outdoor area or an indoor one, you will see sun there, if the sun shows up in a portal (door) of the room. But sometimes you will see beam with the sun in that room, sometimes you won't. It depends on the room at the other side of the portal being an outdoor or an indoor area, and the portal itself being a non-textured, a Toggle Opacity textured or a Toggle Opacity 2 textured one. - If the room is an indoor area, the sun will show up on the sky/horizon in that room, but without the beam. - In fact, you don't even need HORIZON in your WAD or Horizon or Layer script commands or triggers to see sun disk+beam in the level. - It means, if you use tiny black squares on room surface elements, but without sky/horizon out there, so you will see the black nothing out there, then the sun disk will be seen on the black nothing, as if the sky/horizon were out there. - The sun disk will never show up in any other cases, whether with the beam or without it. - There are some cases (at certain sun positions?) when the rules seem a bit relative. 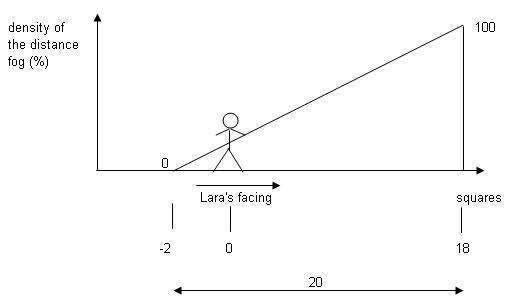 For example, sometimes the 'Lara is too close to that element' will happen, when she is in several squares distance from that element. LENS_FLARE objects don't need LensFlare Script entry to work. The color of a LENS_FLARE beam is a standard white color, i.e. nothing seems to affect its color. - if Lara sees sky/horizon around herself or if she is in a room that is near a room with sky/horizon. - if the seen graphics of the sky is the picture of the RAW file, and, e.g., not the drawn sky on the upper cone of a TR3-style horizon. - Be careful with extreme sky colors. For example, I don't think you will see lightning on the sky, if the color is RGB=255, 0, 0. - If you use both Layer1 and Layer2 at the same time when you want to see the lightning then maybe the sky color won't be the one you count on. Moreover, maybe you won't see lightning and/or any clouds on the sky. 2. The rooms of thunder/lightning don't need to be outdoor areas to present the thunder/lightning. 3. Actually, you will hear thunder even if you don't use Horizon or Layer script commands or triggers to show sky/horizon. All you really need is put a HORIZON object in your WAD. That's why if you place a 'tiny black square' texture tile in a room, not to show sky/horizon but due to technical reasons (see, e.g., when the floor is transparent under steps objects), then you will also hear the thunder in those rooms. - So consider to accomplish that technical transparency in some other way now: with tiny grey squares or magenta patches. 4. You don't need to use Horizon script command to see the lightning - but you need to put a HORIZON object in your WAD. 5. Sometimes it's worth making the lightning enabled in a level, if you use a horizon that is closed at the top (see, first of all, the TR3-sytle horizons), because, though, you won't see the lightning, but you will hear the thunder. (Another trick: if you texture the upper cone of a TR3 horizon to be magenta, then that will be transparent, so you will see the RAW picture above the cone in the game - but it doesn't mean you will see the lightning. 6. This lightning light effect has nothing to do with the electric arches of LIGHTNING_CONDUCTOR, FLAME_EMITTER3 etc. setups or any other lighting techniques (light bulbs etc.). There is a button in Room Editor that reads 'Normal'. If you click on it some times, it will read 'Snow' or 'Rain'. Maybe you think if that button reads Snow then it will snow in the given room, or if that button reads Rain then it will rain in the given room. RAIN_SINGLE_ROOMS: it will rain in all the rooms that are outdoor areas and have the 'Rain' button switched on. RAIN_ALL_OUTSIDE: it will rain in all the rooms that are outdoor areas. RAIN_DISABLED: this value is useless, actually. Because it has the same result as if you didn't have Rain entry in the [Level] block. SNOW_SINGLE_ROOM: it will snow in all the rooms that are outdoor areas and have the 'Snow' button switched on. SNOW_ALL_OUTSIDE: it will snow in all the rooms that are outdoor areas. SNOW_DISABLED: this value is useless, actually. Because it has the same result as if you didn't have Snow entry in the [Level] block. - The room should have at least 10-12 clicks height (or a bit more than that, instead). - It always 'starts raining/snowing' from the ceiling of the rainy/snowy room. Lara's eye level should be lower by minimum 8-10 clicks than those starting points. - If you use 'All' case, then at least one of the rooms of the level must have the Rain button switched on. It doesn't matter if that room is an outdoor or an indoor area. (Naturally, if that is an indoor area, then it won't rain there.) But when Lara enters that room she defines the rain intensity (chosen in the little window next to Rain button in that room) for all the outdoor (rainy) rooms. As you see, 'Rain' and 'rainy' terms are not always the same in 'All' case: it's not sure if it rains in rooms with Rain button switched on, but it's possible that it will rain in rooms without Rain button switched on. After that, if you want to change the rain intensity, then step with Lara into another (outdoor or indoor) room with Rain button switched on, and all the rainy rooms will have the intensity that is chosen in the little window next to Rain button in that room. Adjusting the intensity of snow is analogous with that. 1. Activate this FLIPEFFECT, if you want to switch off Rain or Snow button of the room, during the game. - Never choose 'Flipped' names from the list. It means we cannot switch off the Rain/Snow state of flipped rooms, using this trigger. - If you want to create a flipped room only to switch off Rain/Snow button in the game (so, e.g., if it rains in the original room, but it doesn't in the flipped one), it's an alternative solution if you activate this trigger. - This trigger is a great tool to use three states for a room. For example: the original room is a rainy room. We use this trigger to stop raining there, then later we activate the flipped room of the room to make the room to be a water room. - Some FLIPEFFECTs - just like this - use a room list in Window &. - But that is the source of a problem. - The remarks of Item#1 are also valid now (in an analogous way, of course). - '10-12 clicks' requirement: there will be proper rain/snow in both rooms now, if the difference between the ceiling of Room A and the floor of Room B is 10-12 clicks at least. - 'Lara's eye level' requirement: there will be proper rain/snow in both rooms, if Lara's eye level is lower by minimum 8-10 clicks than the starting point. And the starting point is the ceiling of the upper room now. - For example, this is what is adjusted: Room C and Room D are horizontally connected with each other, and, in Room C, there is no rain, but, in Room D, it's raining. But that's what will happen in the game: Lara is in Room C and looks through the portal into Room D. If she is not too close to the portal, then she won't see any rain in Room D, even if that has a high intensity. - If the rainy room has paper thin walls/floor squares, then Lara will see some of the rain drops hitting those walls/squares, if she looks at those walls/squares from their 'other sides' (i.e. from an adjacent room). You could have the similar problems with snow. 6. You can see only one rain/snow intensity at the same time. So, for example, Room E and Room F are horizontally connected with each other. In Room E, there is Rain Intensity 1 adjusted, and, in Room F, there is Rain Intensity 2 adjusted. 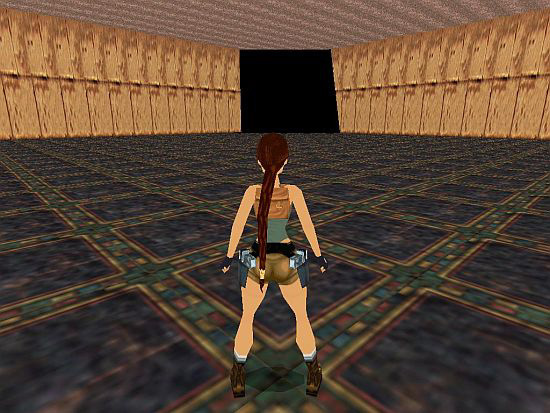 If Lara stands in Room E in the game, she can see Intensity 1 there. But, if she looks through the portal into Room F, she will see Intensity 1 there as well. Now Lara goes into Room F. She will see Intensity 2 there. But if she looks through the portal back into Room E, she will see Intensity 2 there as well. (In this regard, the rain and snow intensities are independent of each other. I mean, change the example, so the adjusted Intensity 2 of Room F now is snow intensity. 7. If the problem I described just above in Item#6 doesn't exist, it doesn't mean you won't have problems with seeing the proper intensity in the adjacent rooms. Moreover, having more states at the same time in the same room may disturb the adjusted intensity of that room. See more about this customization in NG Center\References. The snow cannot be customized at the moment. There are more methods to see fog, mist or some similar effect (smoke, steam, water dust etc.) in the game. To make the things easier, let's call all of them 'fog' in this tutorial from now on. - SMOKE_EMITTER_WHITE nullmesh ('red pyramid') object: switch on/off by triggers. The objects emits vertically an about 1,5 clicks height 'white' (I'd rather say light grey), harmless, continuous smoke. - SMOKE_EMITTER_BLACK nullmesh object: I think there isn't any (real?) difference between this object and SMOKE_EMITTER_WHITE. - STEAM_EMITTER nullmesh object: switch on/off by triggers. The objects emits vertically an about 1,5 clicks height white, harmless, continuous steam. = Type -2008: not the object itself emits the vertical steam now, but an edge of the square of the object (on the vertical coordinate of the object). It is the edge in which direction the bottom of the 'red pyramid' faces. = Type X, in which X=(480xA)+8. The object emits horizontally (in the direction the peak of the 'red pyramid' faces) an about 1,5 clicks long white, harmful ('hot') steam. It works rhythmically: it works for 3-4 seconds, interrupted by A seconds long pauses. - WATERFALLMIST nullmesh object: switch on by triggers. It simulates the continuous mist when the waterfall hits the pool below. You can use a complex OCB number (see NG Center\References) if you want to customize the waterfall mist. - Special fog attached to a given object: see AddEffect Script command in NG Center\References, when you add ADD_MIST or ADD_SMOKE type effects. 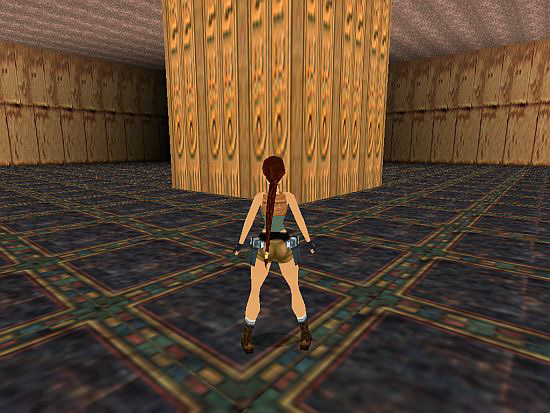 - Textures on portals: do you remember how 'the steam above the jungle' was represented in TR3 Coastal Village level? There was a Toggle Opacity 2 textured portal between a higher and a lower jungle room, with (non-animated but double sided and transparent) 'steam' texture tiles on it. - Other steam objects: if you want some similar steam like that 'jungle steam', but when the steam has some 'special form', then take a (any) object (without collision) and texture that, using those 'steam' tiles, and then place that object in a room. If a room is a mist room that means you will see some spooky light effect on the floor (lowest) level of the room (it's something like the effect of reflex rooms) and on the vertical room surface elements that are around that floor section. - Fog bulbs: it works as a Light bulb, but it emits not light but fog around itself. Global fog - it goes for the whole level: distance fog - see more below. Why? Because the things being far away are mostly unimportant and (relatively) small. The game doesn't want to waste its resources to care about them, so the far things won't be drawn. - And this is the visual range (Paolone calls that 'farview'). I mean, if something is inside the visual range, that will be drawn, but if something is outside the visual range, that won't be drawn. So, if we can't see the northeast corner of the room, because that is too far, then we will see the 'black nothing' behind that non-drawn corner. But, unfortunately, the distance fog won't cover anything that is out of the rooms. In the picture just above this problem is not noticeable, because the black nothing being out of the room and the room parts covered by the black distance fog have the same (black) color. So, a 'belt of hills' horizon is seen in the picture just above - though, we don't want to show sky/horizon from this room. A nice method to solve that problem if we won't let Lara see to the end point of her visual range - so if we place obstacles in the visual range. Anyway, on the room surface elements you WANT to show sky/horizon through, the visual range is 'endless', so you'll always see a perfectly drawn sky/horizon there. And, without seeing any distance fog on them. - You can use the distance fog not only for technical reasons, but as a new feature to create nicer atmosphere in the game. In which X is the required (end point of the) visual range (in squares). In which Y is the required (end point of the) visual range (in squares). 'Fiddling with the distance fog' means you can customize the start/end point and the color of the distance fog (because of whether technical reasons or a nicer atmosphere). - The distance fog always starts in a given distance from Lara. At this point, the density is the thinnest. - The distance fog always ends in a given distance from Lara. At this point, the density is the thickest. The bigger the distance between the start and end points of the distance fog is the more gradual the thickening of the fog between those points is. B: the value of the new end point (in squares). (The default value is the actual visual range end point. If the distance fog ends closer to Lara than the visual range does, then the density is constant, maximal from the end of the fog to the end of the visual range. - So this time we'll see distance fog behind the end point of the fog, as well. If the effect of the distance fog is perfect then the effect of fog bulbs isn't perfect. - This is what happens if we 'enable' the distance fog but 'disable' fog bulbs. On the other hand, if the effect of the distance fog isn't perfect then the effect of fog bulbs is perfect. - This is what happens if we 'disable' the distance fog but 'enable' fog bulbs. If you enable one of the fog types (the distance fog or fog bulbs) then the other type will always be disabled automatically. Check 'Volumetric FX' in the setup of the game. Now the distance fog is disabled, fog bulbs are enabled. Uncheck 'Volumetric FX' in the setup of the game. Now the distance fog is enabled, fog bulbs are disabled. In which A could be ENABLED or DISABLED. If A is ENABLED then the distance fog is disabled, fog bulbs are enabled. If A is DISABLED then the distance fog is enabled, fog bulbs are disabled. But what does 'perfect distance fog/fog bulbs' mean? - Well, it's about the color/presence of the fog. I.e. 'perfect' fog could be colorful, 'imperfect' fog could be only black - moreover, 'imperfect fog bulbs' won't show up in the level. - If fog bulbs haven't been disabled in the actual level before, and if there is not a Fog entry in the [Level] block, and if OldFlip color triggers haven't been activated yet - then fog bulbs will be seen, having black color. - If fog bulbs haven't been disabled in the actual level before, and if there is a Fog entry in the [Level] block, and if OldFlip color triggers haven't been activated yet - then fog bulbs will be seen, having the color that is defined in Fog entry. - If you activate an OldFlip color trigger - then fog bulbs will be seen, having the color that is defined in this trigger. - If you activate a Weather color trigger - then nothing will happen about fog bulbs. - The distance fog will be seen, having black color. - Fog entry or any color trigger has no effect on the distance fog now. - Fog bulbs won't be seen. - Fog entry or any color trigger has no effect on fog bulbs now. - If the distance fog hasn't been disabled in the actual level before, and if there is not a Fog entry in the [Level] block, and if Weather color triggers haven't been activated yet - then the distance fog will be seen, having black color. - If the distance fog hasn't been disabled in the actual level before, and if there is a Fog entry in the [Level] block, and if Weather color triggers haven't been activated yet - then the distance fog will be seen, having the color that is defined in Fog entry. - If you activate a Weather color trigger - then the distance fog will be seen, having the color that is defined in this trigger. - If you activate an OldFlip color trigger - then nothing will happen about the distance fog. - if WorldFarView script entry exists, then the value of WorldFarView. 3 You may start worrying: 'okay, that is nice that I use a bigger visual range, but won't that overload the game'? If you think it's a real problem, but you don't want to decrease the visual range to solve that, then do something else that helps the game to use less memory. For example, delete some objects from the level, have less active objects at the same time etc. - If fog bulbs are just enabled/the distance fog is just disabled, and we'll activate this trigger with 'disable' value - then fog bulbs will be disabled (unseen) and the distance fog will be unseen. - If fog bulbs are just disabled/the distance fog is just enabled, and we'll activate this trigger with 'disable' value - then the distance fog will be disabled and unseen. - We've never activated this trigger with 'disable' value in this level, but now we'll activate this trigger with 'enable' value - then nothing will happen. If you enable the distance fog (in 'the usual way' - i.e. see 'local method' above) between this 'disable' and 'enable' activation, then nothing will happen. < Before b activation, disabling fog bulbs: the distance fog will remain disabled but will be unseen. You can adjust the color of the just unseen fog bulbs by Weather color triggers from now on. < Before b activation, enabling fog bulbs: the distance fog will remain disabled but will be seen, in black color. You can adjust the color of the just seen fog bulbs by OldFlip color triggers from now on. < Performing b activation, if fog bulbs are just disabled: the distance fog will be enabled and seen. Fog bulbs will remain disabled (unseen). < Performing b activation, if fog bulbs are just enabled: nothing will happen. Now the start point of the distance fog is at Square -2, and the end point of the distance fog is at Square 18. The density of the fog is 0 % at the start (-2) point, and the density is 100 % at the end point (18). So at Square 0 (i.e. where Lara is) the density is 10 %. It means whatever we do in the level, Lara's closest environment will be always in 10 % density distance fog, that will be thicker, if we look farther. - Never type -1 as a FogRange value. I mean, don't forget: -1 is the numeric code for IGNORE script command. - 'On the sky/horizon room surface elements the visual range is endless, without distance fog on them' - I said above, but it's not true, if the start point of the distance fog is a negative value. I mean, in these cases, the distance fog will be some kind of 'color layer' on the horizon. I think, the density of that 'layer' is the distance fog density at Lara. - My theory works with linear change. But maybe my eyes can see things in the wrong way, and the density may change in an exponential way or in some other function. So, if I'm wrong, then the intensity is not 10 % in the example above, but some other value. The end point of the distance fog just before activating this trigger is Square 10, and you choose '16 sectors' in the trigger. - If the change is 'pulse' type, the change will happen exactly between Square 2 and 18. - If the change is 'random' type, the change will happen anywhere between Square 2 and 18 (including 2 and 18 themselves). The new, constant end point will be the point where the change has just been stopped. To understand this trigger, just see 'Change End limit' trigger just above. At the moment, there is no similar trigger for the end point. In a given time, the start point moves to the given, new position, then comes back (in the same time), continuously. The range of the distance fog remains constant during that, so the end point will move in the similar way. The new, constant start point will be the point you give in this trigger. The new, constant end point will be the end point just before this continuous change. - If fog bulbs are enabled, the continuous changes (except: 'Change Start Fog') won't work. - If you are just enabling fog bulbs, the distance fog range will get the default values (i.e. start point=12 squares, end point=visual range end point). (Then disable fog bulbs in 'the usual way', 'to correct this mistake', i.e. to restore the values just before the enabling. - But, you can't do that restoring, of course, if you changed the values between the enabling and the disabling. Use only positive sector values of Window &. If Lara is farther from any fog bulb than the given value, she won't see the fog of the bulb. (The default value is only: 'inside the visual range', as I know.) - The trigger can be activated even when fog bulbs are disabled. As you see, the appearing black nothing will be ugly, if you use a non-black distance fog. - A good choice to solve the problem, if you use a TR3-style horizon, texturing the whole horizon with monochrome texture tiles, where the tiles have the same color as the distance fog has. In the left screenshot, we can clearly see the end point of the visual range, with black distance fog, through the red fog bulb. This is obviously ugly. - Avoid this kind of situations. In the left screenshot, there are two portals on the wall in the background. Both portals are textured by Toggle Opacity 2 method, placing transparent texture tiles on them. 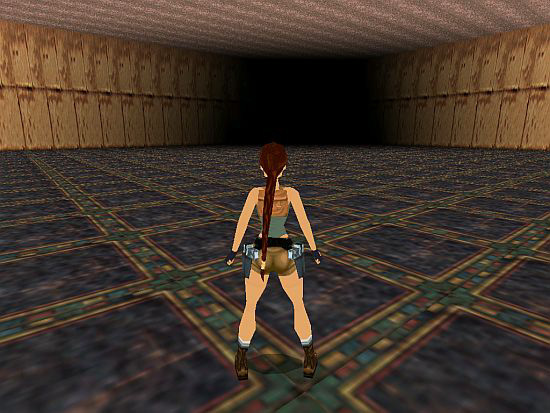 Lara can see the right portal through the blue fog bulb, but the left portal is farther from the fog bulb, so she mustn't see the blue fog on the left portal. You could have this kind of/similar kind of troubles with all the transparent textures in your game (even with the distance fog), whether those textures are on room surface elements or on object faces. You can see the result in the right screenshot. 10. You can use a trick to 'switch off' the distance fog: if both its start point and end point has a bigger value than visual range does. - You could have maximum 80 fog bulbs placed in the whole level. - You could see maximum 32 fog bulbs working properly at the same time. - You could have maximum 32 bulbs (aggregated amount of all the light, camera, fog, sink, sound bulbs) placed in a room. - See 'Effects: X of 768' in Info Box of Room Editor. X is the actual, 768 is the maximum aggregated amount of the light and fog bulbs in the whole level. 12. According to my experiences, the state of fog is always 'fog bulbs disabled/the distance fog is enabled' in train levels. 13. The subject of the fog has nothing to do with you using Horizon or Layer script commands or triggers, HORIZON object or outdoor/indoor areas. 1. You may have problems with some weather features if you use them in title level. 2. You can make a weather feature more perfect, if you use some proper lighting technique in your rooms. For example: if the horizon is just 'dark night' around Lara, then you should use dark ambience light there. 3. It seems cameras always work as if they were Lara, when a given weather effect/visual range must be represented. I.e., for example, if Lara must answer some requirements to see rain around herself, then the just active fixed camera must also answer the same requirements to see rain around itself. 4. Don't forget: a trigger won't do anything if there's nothing to do. - For example, if Lara steps on a trigger that disables fog bulbs in 'the usual way', then nothing will happen if fog bulbs are just disabled. Okay, maybe you think it is evident, but believe me, it's worth mentioning it now. In fog section, at Item#7 I said, enabling fog bulbs in 'the usual way' makes the distance fog to have the default range. But if you activate that enabling trigger when fog bulbs are just enabled, then nothing will happen - including the distance fog will not get its default range. 5. There are some old TR4 script commands about weather that don't work in NGLE any longer or that have an unknown usability (for example: StarField command). - See more about them in NG Center\References. So the color is RGB= 245, 200, 60. You will see the aggregated value of the flags in the field. For example, with an existent Horizon= ENABLED entry, an existent Layer1 entry and an existent LensFlare entry, but without other entries of the list being existent, the value of the field is: 4+8+2048= 2060. If you change the value of the field, using 'Variable' FLIPEFFECTs, then you are able to enable a disabled script flag (or create a flag that was non-existent so far, creating that in enabled state) or disable an enabled script flag. (It's not enough, if you enable a flag that has other value than 'ENABLED'. 2. As you see, 'Script Dat. Level Flags (Use bit operation to read or change) (Short)' field can do something that none of the 'usual' FLIPEFFECTs can do now. - For example, you could disable LensFlare during the game, for the whole level. I mean, see for example this case: you have a train level, with Train= ENABLED flag. There are no triggers to 'start/stop the train' in the game, but 'the train will stop', if you remove that flag, removing its value (128) from the aggregated value of the field, giving a new value to the field.